Antique 17th - 18th century Polish cavalry sword. 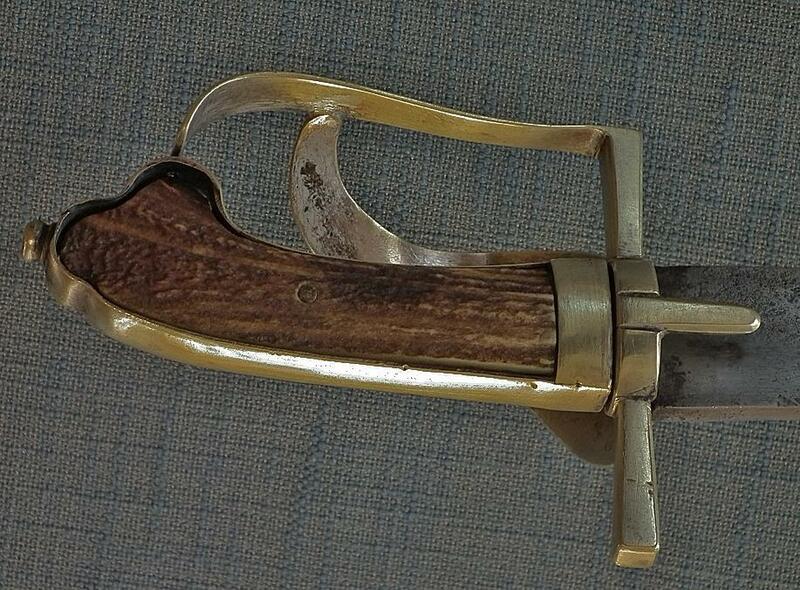 With a very rare 17th century Solingen blade mounted in 18th century Polish hilt. 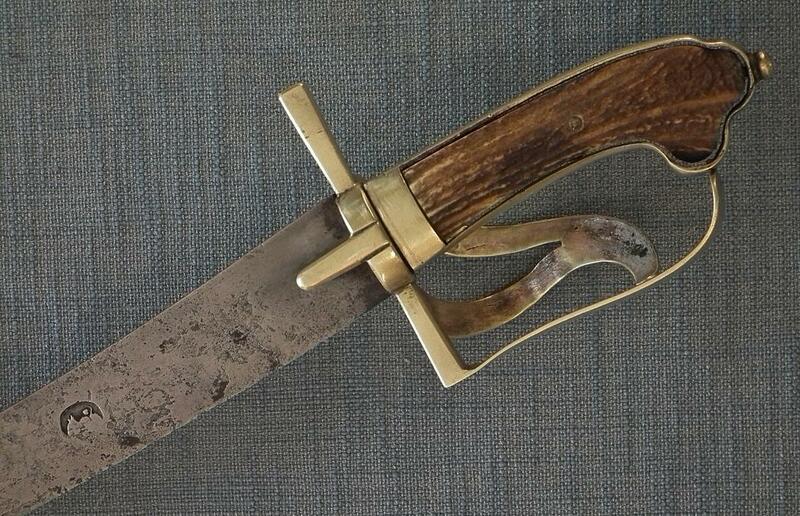 The distinguishing style of this blade is characteristic for 17th century sword blades made in the fashion of 17th century Turkish Ottoman sword blades specially made by Solingen swordsmiths specially for the Polish and Hungarian market and often can be seen on Polish and Hungarian sabers stamped on either side with the half-moon mark. 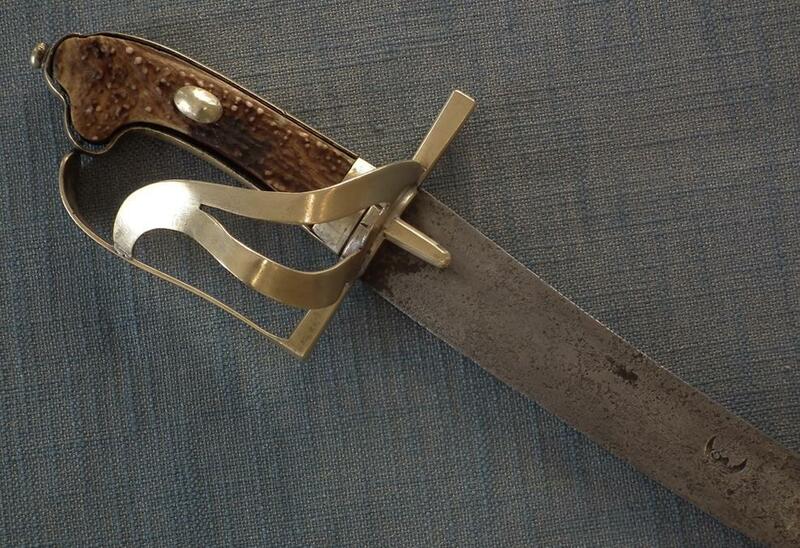 The half- moon was used during late and early 17th century by several Solingen bladesmiths. Please see Wallace Collection Catalogues European Arms and Armour by Sir James Mann Volume II, page 343, No A675. Details: Slightly curved single edged sturdy steel blade of fine form with a broadened lower part of the blade Yelman raised on the back to a false edge, stamped on each face with crescent moon. 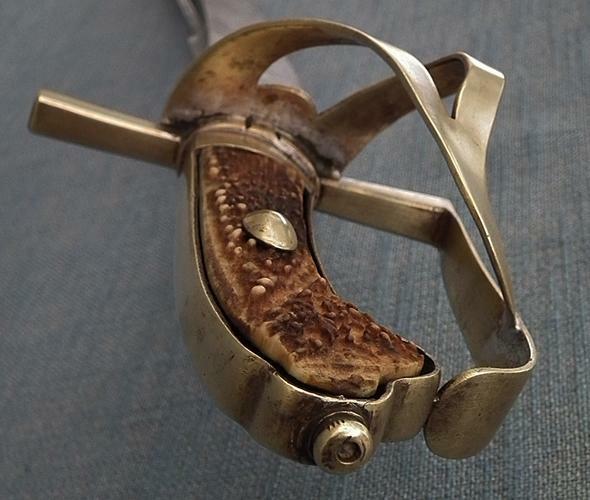 18th century three-bar brass stirrup hilt in 18th century polish hussar form with a massive square in the section of the crossguard, with bevel edges and a pair of langet knuckle bow with two shaped side bar guards. A staghorn grip in the characteristic karabela form enclosed in brass frame and set on the outer site with halved olive brass buttons. 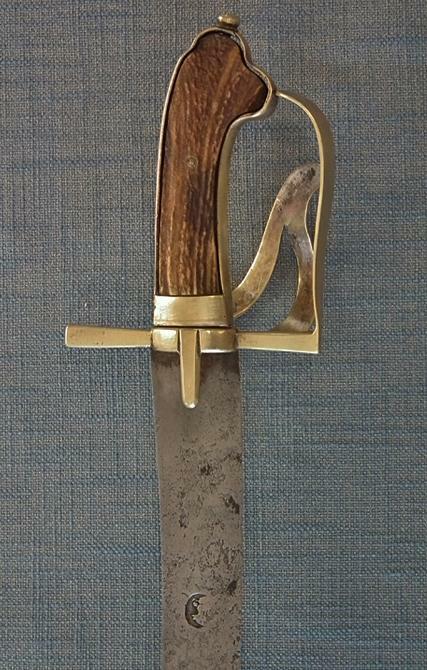 18th century Polish sword with similar style guard is published in the catalogue: Szabla polska. Arsenał Warszawski [katalog wystawy]. Warszawa 1980 Państwowe Muzeum Archeologiczne by Jan Dunin-Karwicki, catalogue number 13. CONDITION: The blade is pitted, the hilt is in good condition. The brass hilt has several minor remains of silver plating which was deliberately and thoroughly removed in the time when the sword was used where it got worn-out. All of this is an aspect from a used antique combat sword that is over 250 years old. Please see the photos as they are a part of the description. Since high-quality, 17th century Solingen swords blades were very valuable, they were passed from father to son and were used by the next generations. 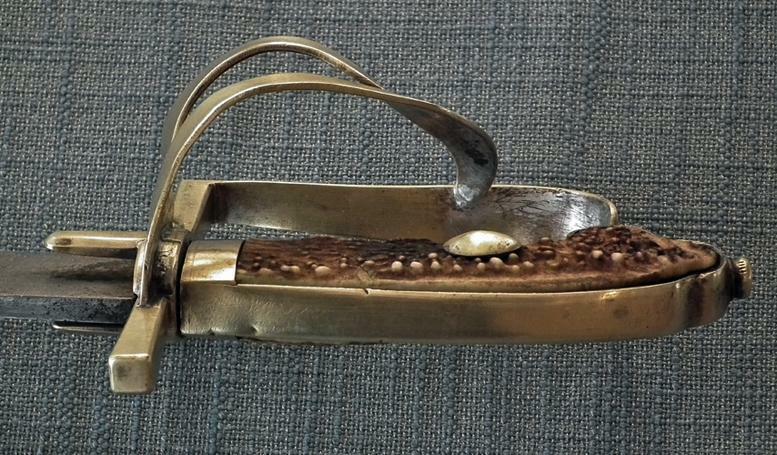 So, fine old blades dating back as far as the 17th century were still used during the 18th century but were remounted with a new fashion such as 18th century mountings. It was also practiced in Ottoman Turkey and Japan when the expensive old sword blades were remounted to a new mounting and were still used in the 18th and 19th century.